I love Gmail. Especially the new feature that sorts incoming messages into separate inbox tabs: Primary, Social, and Promotions. There is one drawback, I’m more likely to miss an interesting offer or deal because I tend to ignore anything that lands in the Promotions inbox. 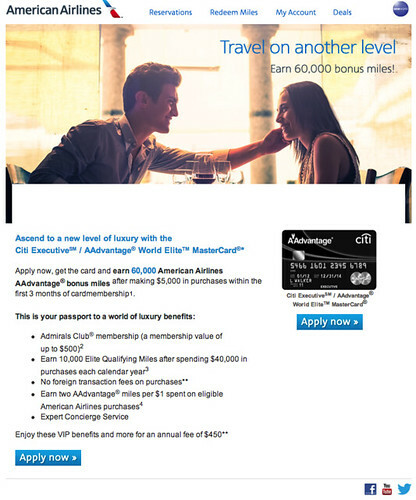 Apply now, get the card and earn 60,000 American Airlines AAdvantage bonus miles after making $5,000 in purchases within the first 3 months of cardmembership. That’s 20,000 more miles that the current offer on AA.com! Unfortunately, it’s targeted, so I don’t have a link to share. One downside of the card (for some) is that while many employers will pay for your Admirals Club membership, few will reimburse you for the annual fee. So, in effect, you’ll have to pick up the tab for club membership. Anyway, keep an eye on your inbox! It includes photos of a Pakistan International Airlines that landed on its belly because the pilot forgot to drop the landing gear. Doh! Since the update, the mobile Gmail app has taken a turn. If you delete something from Promotions or Social it will eventually show back up. Mass deleting is no longer an option either. The whole thing is a little buggy. I ended up logging thru a web browser and shut off the new tabs. I see a patch or two in its future. @ Kyle – Oh wow, I didn’t know about that. I had vowed to use my iPhone do a better job of managing (and pruning) the Promotions inbox so that I don’t have important messages waiting on me for days. Guess I’ll have to wait for Google to make a few fixes. i swear that these credit card companies know who you guys (bloggers) are and always seem to provide the best offers to you. @ Nitin – I maintain a separate email account for the blog, and the offer was sent to my personal email address, the same one associated with all my other Citi and Citibank accounts. So I’m sure the offer was based on my profile as a Citi customer. As far as I know, Citi is completely unaware of my blog email address and my identity as a blogger. I don’t even know anyone in their PR department. I know. i’m just kidding. @ Ntitin – “t was funnier in my head” – I know the feeling, most of my posts are funnier/better in my head. @ aadvantagegeek – I forgot to mention I was on Android. Other were complaining on the google app store site also so I know its not just me. I haven’t heard anything on the Apple version. @ konrad – I wish I had received your offer! Guess that means there’s more than just one targeted offer, thanks for sharing! I am not a Citi customer and I received the same offer. I also received an offer for 50k on the platinum via snail mail twice in the last week. @ Boon – I don’t pay attention to the snail mail offers, they usually go straight to the shredder. Maybe I’ve been missing out all along….guess I’ll start reading them now. Thanks for the info! Snail mail offer of 50,000.